I recently returned from birding Colorado with Phil Rusch and Bill Asteriades. We flew into Denver midday on April 2 and left very early on April 10, making for 7 1/2 days of fast-paced birding. This was a whirlwind tour of Colorado as we tried to squeeze into a week what the major tour companies do in 9-12 days. 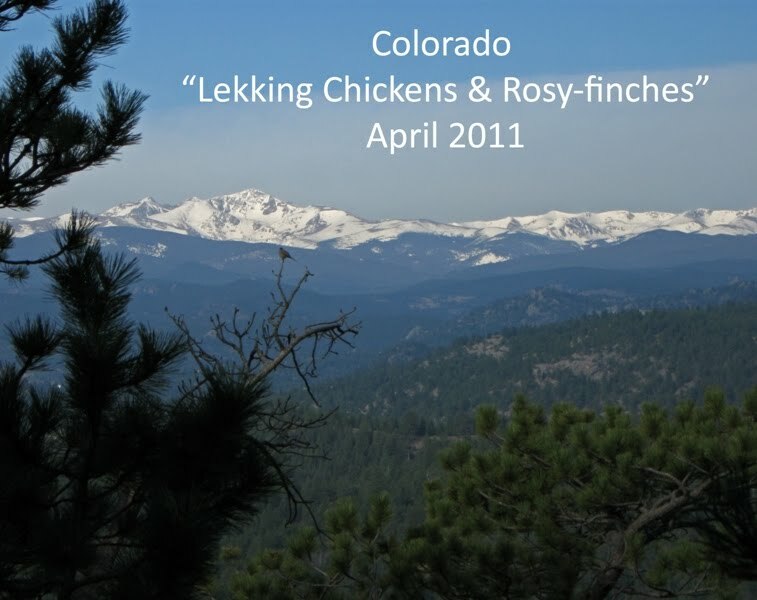 The trip was focused on 8 key species: the five lekking chickens and three rosy-finches. These were, by far, the most important species to see in Colorado at this time of year. The normally hard-to-find chickens are displaying in early spring, and if you're lucky you can find all 3 rosy-finches in one flock. We ended up going 8-for-8 on our "Tier 1" species. In fact, only one of them (Greater Sage-Grouse) really gave us any trouble at all. The problem with trying to see all 5 of the lekking chickens in one week is that they're spread all across the state, often with a couple hundred miles or more between leks. The rosy-finches can occur in any mountain town, but they were particularly scarce this year, which forced us to go just a bit out of our way to find them. By the end of the week we had put an astounding 2,576 miles (!) on our rental vehicle. I have personally planned a handful of birding trips in the U.S., but none have compared to this trip in regards to difficult logistics. The unstable early spring weather in Colorado could wreak havoc on your trip at any time. This is one of the reasons why we kept such a fast pace to the tour...we never knew when we'd be snowed-out of a lek or when a mountain pass might be closed to vehicles for a day or more. If you ever plan this trip yourself, the key is preparation. You need to know the locations of the leks (some may vary from year to year), how to reach them, and some insider tips from the locals always help. We owe a huge THANK YOU to Joe Bear, Mark Stevenson, Christian Nunes and the many other contacts who helped point us in the right direction. As I mentioned before, this was truly a 'quality-over-quantity' trip. Since we did so well with our big 8 target birds, we were actually able to spend some time on our secondary targets like Pinyon Jay, Clark's Nutcracker, Northern Pygmy-owl, Three-toed Woodpecker, etc. Back to the chickens that make this trip so worthwhile, we had good luck with the five lekking species: Gunnison Sage-Grouse, Greater Sage-Grouse, Greater Prairie-Chicken, Lesser Prairie-Chicken, and Sharp-tailed Grouse. As a bonus, we had nice looks at a White-tailed Ptarmigan on Day 1. Later in the trip we heard a couple of Dusky Grouse but were never able to get a visual - a bit of a bummer for Bill who still needs that for a life bird. FWIW they are rather widespread in the mountain west and can be seen during any of the warmer months. As for the rosy-finches, we had all 3 species (including "Hepburn's" Gray-crowned) in one mega-flock on Day 2, which would go down as one of the major highlights of the trip. I believe our bird total came to about 140 species. Not bad given our focus on just a handful of birds. We also came up with several great mammal sightings including Bighorn Sheep, Pronghorn, Abert's Squirrel, and a stunning Swift Fox. Another bonus came in the form of a Neotropic Cormorant that you can read about in my previous post. I'll go through the trip day-by-day and post some photos and video where appropriate. Yep :) Thanks to local birder Scott Rashid, we had a pair duetting and watched the male call and fly around at dusk.